Lexie Brown helped to lead the University of Maryland to two Final Four berths before transferring to Duke, where she finished out her college career. This year, Brown was drafted by the Connecticut Sun — and after recently finishing up her rookie season, she’s ready for some time off, and a little more time to splurge with meals, too. Why I’m eating it: Baked ziti is one of my absolute favorite meals ever. Any time my mom asked me what I wanted for dinner I always asked for it. No matter what. I wouldn’t recommend a plate of baked ziti before a big game or tough workout, but it’s great for right after! I made this on a visit to some old teammates. They had definitely had a long, hard week of workouts so I wanted to treat them! Heat the olive oil in a pot over medium heat. Add the garlic and onions and sauté until starting to soften, 3 to 4 minutes. Add the ground beef and cook until browned. Drain off almost all of the fat, leaving a bit behind for flavor and moisture. Add the tomato sauce, tomatoes, Italian seasoning and some salt and pepper. Stir, bring to a simmer and simmer for 25 to 30 minutes. Remove 3 to 4 cups of the cooked sauce to a bowl to cool down. Bring a large pot of water to a boil and add some salt. Cook the ziti until not quite al dente. In a bowl, mix 2 cups of the grated mozzarella, the ricotta, Parmesan, parsley, eggs and some salt and pepper. Stir together just a couple of times (do not mix completely). Drain the pasta and rinse under cool water to stop the cooking and cool it down. Pour it into the bowl with the cheese mixture and toss to slightly combine (there should still be large lumps). Add the cooled reserved meat sauce and toss to combine. Add half the coated pasta to a large casserole dish or lasagna dish. Spoon half of the remaining sauce over the top, then top with half the remaining mozzarella. Repeat with another layer of the coated pasta and the remaining sauce and mozzarella. Bake until bubbling, about 20 minutes. Let stand 5 minutes before sprinkling with chopped parsley to serve. View the story on espnW. Three inspiring female athletes on what helps them lean into self-love, and why confidence is the ultimate style essential. You’ve heard it all before: If you’re confident and you “own it,” you’ll always look great. It’s a philosophy that’s easy to get on board with, but one that isn’t always the easiest to live by. Everyday stressors can trigger an onslaught of insecurities, and scrolling through filtered Instagram images 24/7 can leave you feeling downright inadequate. But the truth is that confidence is a muscle; the more you practice and work it, the stronger it becomes. Unfortunately, unlike building a stronger booty or core, there isn’t a gym class that can help you get there. But there are a variety of ways to feel more comfortable in your skin. Together with Macy’s The Edit and the Macy’s Fashion Office (two amazing places to get clued into all the latest Fall trends), we’ve turned to three multifaceted, accomplished, fitness-obsessed chicks—a WNBA athlete, a USA National Team gymnast, and one of our very own editors—for a confidence refresher course. While each has unique tactics, they all utilize fashion to psych themselves up so they can kill it in the gym and beyond. Read on for tips and tricks. Read the full story on Women’s Health. Midfielder Meggie Dougherty Howard is in just her second year of professional play, representing the NWSL’s Washington Spirit. But the University of Florida All-American is no stranger to high-level soccer. Dougherty Howard has represented the U.S. in national competition on both Under-15 and Under-23 teams. Chicken and veggies are Dougherty Howard’s go-to pregame meal, so she shared with espnW one of her recent favorite Pinterest finds — perfect to send off summer and embrace the remaining weeks of grilling weather. Why I’m eating it: I love to grill, especially in the summer when the weather is nice outside, because it’s a great way to make a quick meal that’s full of flavor. I try to incorporate a lot of colors in my cooking, so I love that this recipe uses a variety of vegetables and is packed with nutrients. On lighter training day, I’ll pair the kabobs with a side salad. When I’ve had a heavier day and my body needs more calories, I’ll serve the chicken and veggies over brown rice. Whose recipe: I do a lot of browsing on Pinterest for new food to cook, and that’s where I found this recipe. Combine the ingredients for the balsamic glaze and add half of the glaze to the cubed chicken in a bowl. Let it marinate while chopping the vegetables. Chop the veggies, then assemble the kabobs, alternating between veggies and chicken. Grill the kabobs on medium-high heat for 3-4 minutes each side. Brush on the remaining balsamic glaze for the last 2 minutes of grilling. Serve with cooked rice or salad. Roughly a month remains before the Ultimate Fighting Championship touches down in Russia for UFC Fight Night 136. A heavyweight battle between 2001 K-1 World Grand Prix winner Mark Hunt and 41-year-old submission savant Alexey Oleynik will headline the historic event in Moscow. Oleynik has rattled off 14 wins across his past 16 appearances. He last fought at UFC 224 in May, when he submitted Junior Albini with his patented Ezekiel choke in Rio de Janeiro and improved his record inside the Octagon to 5-2. In this exclusive interview with Sherdog.com, Oleynik shares his emotions ahead of his next assignment, his thoughts on Hunt and his opinion on hyping fights. Sherdog: What has the process been like leading up to this event? Oleynik: I didn’t wait long for an answer about my fight and opponent. After my victory in Brazil, I was asked who I wanted to fight. I said I wanted to fight Fabricio Werdum. He’s the most famous grappler in the world and one of the best. It would have been a tough fight, and I think many fans were looking forward to it. We signed to fight Werdum in Moscow, but the bout was canceled because of his anti-doping violation. Hunt was the only other option with a legendary name, and I agreed to the fight immediately. Sherdog: What does it mean to you to headline this historic show? Oleynik: I’m very excited to be in the main event. This is MMA history — it’s the first UFC event in Russia — and I’ll do my best to win. Of course, it means a lot to me but my focus is on the fight so I can perform as well as possible. My wings are no longer growing as strong in my 40s, and this fight is not the first, fifth or 40th of my career (laughs). I’m quite experienced, and I know what to do. You just don’t push past your limits. Sherdog: Do you think they can fill the card with big names? Oleynik: I believe Andrei Arlovski is a pretty big name as a three-time UFC champion; he’s on the card. There’s also [Adam] Yandiev. He may not be widely known abroad, but in the (Commonwealth of Independent States), he’s a very popular guy. Sherdog: Do you think the UFC’s presence will eclipse Russian promotions or increase attention in their favor? Oleynik: I don’t think the UFC will overshadow all the Russian promotions. You never know how an event will go or how the fighters will perform. Sometimes average promotions may have entertaining fights; they can use those fights for highlights and broadcast them on the Internet and TV. Plus, there are dozens of different organizations, really competitive MMA companies with high-level fighters and fights that serve as steppingstones for younger fighters. Sherdog: Khabib Nurmagomedov–Conor McGregor is always hot news. McGregor came to the FIFA World Cup final and met with Russian President Vladimir Putin. How do you feel about the hype? Oleynik: Hype is the correct word, but on the other hand, it’s part of martial arts and any other sport for that matter. You need those types of things to evaluate public interest in a particular event. They try to figure out whether or not they need to give it a go. They make fame and fortune out of it. For example, Conor and [Floyd] Mayweather made a lot of money, so other fighters want to get as close as they can to Conor in order to make a lot of money. [Nate] Diaz fought dozens of times in the UFC, and his purses never exceeded $40,000 to $50,000. After two fights with Conor, he asked for six figures. You can have 20 fights in the UFC and earn $500,000 or you can get a million for just one fight. Of course, that’s what everyone wants, so they try to make money with hype and trash talk. You can name people who are successful at that and those who aren’t successful at it. Let’s see what happens next. WARREN, NJ, July 25, 2018 – Lexie Brown, 2018 WNBA First Round Draft pick, has signed with IPZ, the company announced today. Brown is a 5-foot-9 point guard who was a McDonald’s and WBCA All-American coming out of high school. She began her collegiate career at the University of Maryland and led the Terrapins to the NCAA Final Four as a freshman in the 2013-14 season and again as a sophomore the following season. In the 2014-15 season, Brown was named to the Associated Press (AP) All-America Third Team. The point guard decided to transfer to Duke, competed as a Blue Devil in the 2016-17 season, and was named a co-captain. Her 18.3 points per game is the highest for a first-year player in the school’s history. Brown ranked third in the nation in free throw shooting, converting 92.8% of her attempts, and went on a streak of hitting 56 consecutive free throws (most in Duke and ACC history). In addition to being named to the AP All-America Third Team for the second time in her college career (the only player in NCAA history to accomplish this at two different schools), she was also a CoSIDA All-American and the winner of the Kay Yow Award as the ACC women’s basketball scholar-athlete of the year. As a senior, Brown remained a co-captain and captured additional accolades: AP and espnW All-American, ACC Defensive Player of the Year, All-ACC First Team, Senior CLASS Award finalist, Kay Yow Award winner, preseason ACC Player of the Year, and numerous more. Brown averaged 19.4 ppg and 3.7 spg (led ACC). She was also the only active NCAA player to notch 2,000 points, 500 assists, 250 three-pointers, and 300 steals. Following her storied college career, Brown participated in the 2018 State Farm College 3-Point Competition. A few weeks later, on April 12, the three-time All-American was selected with the ninth overall pick in the WNBA Draft by the Connecticut Sun. Brown has appeared in 16 games for the Sun so far this season and will be playing overseas for CMB Cargo Gyor, a Hungarian EuroCup team, shortly after the conclusion of the WNBA season. Outside hitter Kelsey Robinson is used to living out of a suitcase. This spring the 2014 world champion and 2016 Olympic bronze medalist was in five countries in five weeks competing with the women’s national team in the Nations League. But continent hopping and jet lag don’t slow down the self-declared foodie and travel addict, who keeps a food and travel blog, called Nom & Play. Day and time: This is my go-to breakfast when I have any morning free from training. Why I’m eating it: What I love most is that this provides me with sustainable energy throughout the day. It has the big four that I try to incorporate into every meal: protein, fat, fiber and greens! 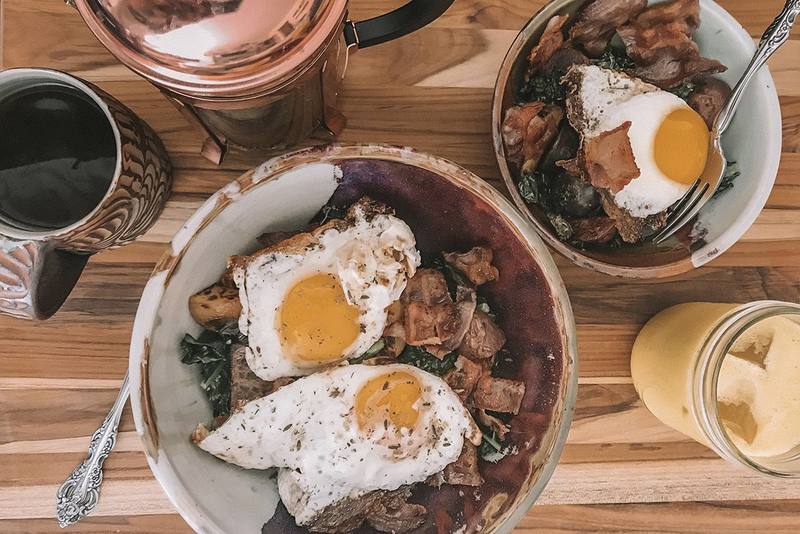 While I typically like to make a big portion for mornings off, you can totally make it before a morning practice or weights session and it’ll power you through. Whose recipe: This was the first dish my fiancé ever cooked for me, and needless to say I fell in love with him right then and there. Obviously I had to steal the recipe and tweak it to make it my own (and a little better). Boil quinoa to cook (I usually do this the night before and store it in the fridge, but you can also do it in the morning). Chop or grate and cook sweet potatoes if using. Melt coconut oil in a pan over medium heat. Add bacon, and cook until crispy. Remove from pan and cook onions in leftover bacon fat. Add greens to saute briefly, then crack eggs into pan and cook. Season with salt and pepper. When eggs are almost cooked, add the quinoa so it can heat up if you made it the night before. Combine quinoa and eggs in a bowl, topping with bacon, turmeric, tapatio, avocado and your choice of other ingredients. I like to add sweet potato hash browns, beets or even leftover salad. Read the story on espnW. The only man to win by Ezekiel choke—twice–in the UFC, Alexey Oleynik (56-11) is honored to fight a mixed marital arts legend Mark Hunt, but he was looking forward to duke it out with a jiu jitsu extraordinaire Fabricio Werdum. Oleynik has been unofficially announced to take on Mark Hunt (13-12) in the UFC’s first visit to Moscow, Russia in September 2018. His last fight was against Junior Albini where he defeated his foe by Ezekiel choke in May. Originally, Oleynik was scheduled to fight former heavyweight champion Werdum, but he was pulled from the fight after he was busted for using illegal substances. Oleynik last fought in Russia back in 2013, so it is like a homecoming for him. He said he is looking forward to a fight with the New Zealand brawler. He added that Hunt has competed against top caliber fighters and has much respect for him, but he was looking forward to fight Werdum to match skills. View the story on RodolfoRoman.com. A full-service professional baseball agency created by offspring of local legends with deep connections to the New York Yankees has formed a strategic link with Warren-based strategic agency IPZ, the companies announced Tuesday. Pro Agents Inc., headquartered in Woodbridge, was established in 1995 by Major League Baseball agents David Pepe and Billy Martin Jr. Over the past 23 years, Pepe and Martin have combined to negotiate more than $200 million in contracts. Pepe is the son of the late baseball writer Phil Pepe, who covered sports in New York for more than five decades, including several as the beat writer covering the Yankees for The New York Daily News. Martin is the son of the former Yankees second baseman and five-time manager Billy Martin. Among the players the agency has represented or currently represents are six-time MLB All-Star reliever Joe Nathan, former MLB pitcher Carl Pavano, current Los Angeles Dodgers pitcher Tom Koehler and 2016 first-round pick of the Los Angeles Angels, Matt Thaiss. Specialists in contract negotiation and off-field management, Pro Agents will receive support from IPZ with public relations and marketing opportunities for current and former baseball clients. 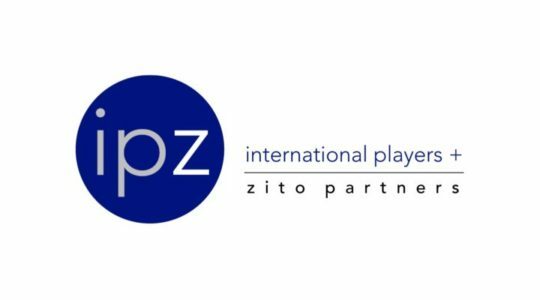 In addition, IPZ, through its network of coaches and sports contacts, will refer baseball players to Pro Agents for representation. Pepe, a member of the New Jersey Bar, will also be available to assist with other contracts for IPZ athletes. IPZ is a management, representation and consulting company aligned with public relations and marketing communications Zito Partners, also based in Warren. View the story on NJBiz here. WOODBRIDGE, NJ, and WARREN, NJ, June 12, 2018 – Pro Agents, Inc., a full-service professional baseball agency, has formed a strategic alliance with IPZ, the companies announced today. Pro Agents was established in 1995 by Major League Baseball (MLB) agents David Pepe and Billy Martin, Jr. Over the past 23 years, Pepe and Martin, Jr., combined, have negotiated more than $200 million in contracts. Among the players the agency has represented or currently represents are 6-time MLB All-Star Joe Nathan, former MLB pitcher Carl Pavano, current Dodgers’ pitcher Tom Koehler, and Angels’ 2016 first round pick Matt Thaiss. Known for its expertise in sophisticated contract negotiation and shrewd off-field management, Pro Agents will receive support from IPZ with public relations and marketing opportunities for current and former baseball clients. In addition, IPZ, through its network of coaches and sports contacts, will refer baseball players to Pro Agents for representation. Mr. Pepe, a member of the New Jersey Bar, will also be available to assist with other contracts for IPZ athletes. “It is an honor to work with the professionals at IPZ to help us continue to provide the best service available to all Pro Agents’ clients,” said Pro Agents’ David Pepe. About IPZ: IPZ represents clients in sports, media, and entertainment, providing management, contract negotiations, consulting, public relations and marketing communications support. The company, an alliance with Zito Partners, is built on the integrity of its professionals, maintains a family focus, and provides whole life solutions for its clients. For more information, visit www.ipzusa.com.